There are currently two methods of getting your windows to comply with the current Building Regulations. The first is that you can aim for a Window Energy Rating of at least a ‘C’. Alternatively you can stick to the tried, tested and traditional U-values. The U-values now needed to comply to part L of the building regulations, however, are much lower (at just 1.6 W/M²K for windows and 1.8W/M²K for doors) and are harder to achieve than previously required. For doors U-values are curently the only option for compliance, however for windows, WERs provide an easy alternative, which can be easily achieved by increasing solar gain. You do not need to consider both a low U-value and a high Energy Rating. In order to comply to the Building regulations you just need to pick one, but which one? Consumers are increasingly focused on the energy efficiency of building products to reduce their contribution to carbon emissions. The basic U-value (thermal transmittance) does not fulfill all of these requirements because it only aims to give a value for the insulation properties of a window. It only focuses on the heat loss from the window and takes no account of the solar heat gain that windows are responsible for, and how they can improve the overall energy efficiency of a property. 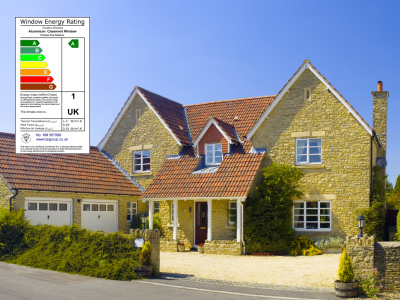 The window energy rating scheme provides a very good idea of exactly how environmentally friendly your windows are. This rating allows ease of understanding / recognition by using familiar charts and labels. Widens choice, by allowing people to choose more energy efficient products for their property. Allows people the choice to contribute to the overall reduction in greenhouse gases. Energy rated windows could reduce heating and fuel costs by up to 10%. Rising fuel and heating costs reduces the payback time on fitting new energy efficient windows. 'A' rated windows can have a 'Zero' energy loss of a years cycle and can even add heat energy into a property through solar gain. 'C' Rated windows have a 94% lower heat loss than an 'E' rated window. They help create more competition within the glass industry. You can use WER to comply with doc L under the October 2010 building regulations, with a WER ‘C’. You can use U-values across the board (Dommestic and Commercial applications). Arcitects will always work to U-values and not WER's. U-values are recognised in the building regulations for both windows and doors. Lots of solar heat gain is not always a good thing for many applications (for example conservatories). U-values provide a definative measurement for Thermal efficiency (W/M²K). WER do not provide an absolute measurement of energy performance they are simply intended as a guide. Many consider WERs to be over simplified. Window Energy Ratings are more aimed towards the domestic market, where as they are considered unsuitable for use in the commercial market. This is due to the fact that in many large commercial buildings, especially those with large glass area, more money is spent on air conditioning in the summer than on heating during the winter. Therefore to specify windows with high solar gain, would be a false economy.